A new set of just-approved emoji are coming to your phone, ones that help close the gender gap between male and female emoji and show a greater representation for both women and men in the work force. The two that weren't approved were a healthcare worker and a high-tech worker; Unicode explained in a detailed report that a wide range of healthcare professions could be represented by a single emoji, and that it was hard to tell what the high-tech worker was at small scale. 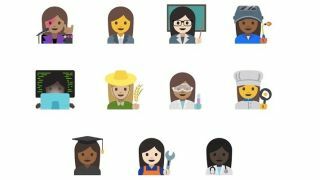 A female mechanic, chef, rockstar and professor are a conspicuous break from how women are typically depicted in emoji form, i.e. as princesses and brides. Unicode also gave the thumbs up to male and female versions of 33 existing emoji, meaning you can now pick a female runner or a male runner, or a man or woman getting a haircut. Future versions of Android can include the new emoji, but it's not limited to only Google's operating system. Since Unicode works across platforms, so will the emoji on everything from iOS to WhatsApp to SwiftKey and more. The new emoji pave the way for vendors to start design and implementation work now so they can be deployed by the end of the year, Unicode says. If they'd waited, the emoji likely wouldn't arrive until Unicode v10.0's release in June 2017. While new emoji may seem like a nominal gesture towards greater diversity, Google says that more than 90% of the world's online population use emoji. More accurately reflecting what the real world looks like - and giving younger generations representations of professions they may not see elsewhere - are both good things.